This heroic bronze equestrian statue depicts Argentine general José de San Martín (1778?1850), who helped Argentina, Chile, and Peru gain independence from the Spanish in the early part of the 19th century. The statue is a replica of a work by French sculptor Louis Joseph Daumas (1801?1887) dating to 1862. The original is in Buenos Aires in a more elaborate setting. 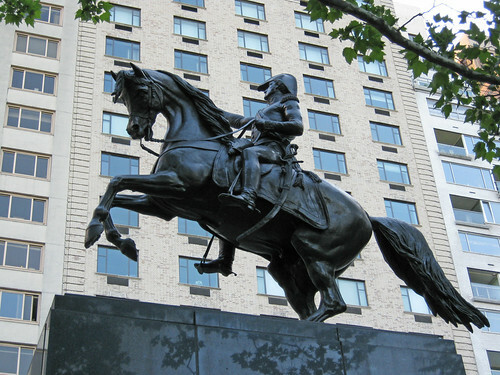 In 1950 the City of Buenos Aires gave this piece to the City of New York, in exchange for a statue previously sent to Argentina of General George Washington to whom San Martín is often compared. The monument was dedicated on May 25, 1951 on a pedestal of polished black granite designed by the noted architectural firm of Clarke & Rapuano. The piece is one of a trio of bronze equestrian sculptures representing Latin-American leaders that greet visitors to Central Park at the north end of Avenue of the Americas. Formerly Sixth Avenue, Mayor Fiorello H. LaGuardia (1882?1947) suggested renaming it in 1945, to honor Pan-American ideals and principles. Following the renaming of Sixth Avenue, a new plaza was designed where the avenue meets Central Park, and the monument of Simon Bolivar (1783?1830) was moved to the eastern side of the plaza and rededicated in 1951. A month later the statue of San Martín was unveiled on the plaza?s west side, and in 1965 the monument to Cuban patriot and author José Martí (1853?1895) was dedicated between the two earlier works. The monument was conserved in 1995 by the Central Park Conservancy with financial help from the Government of Argentina and the Comisión pro Restauración Monumento General José de San Martín.